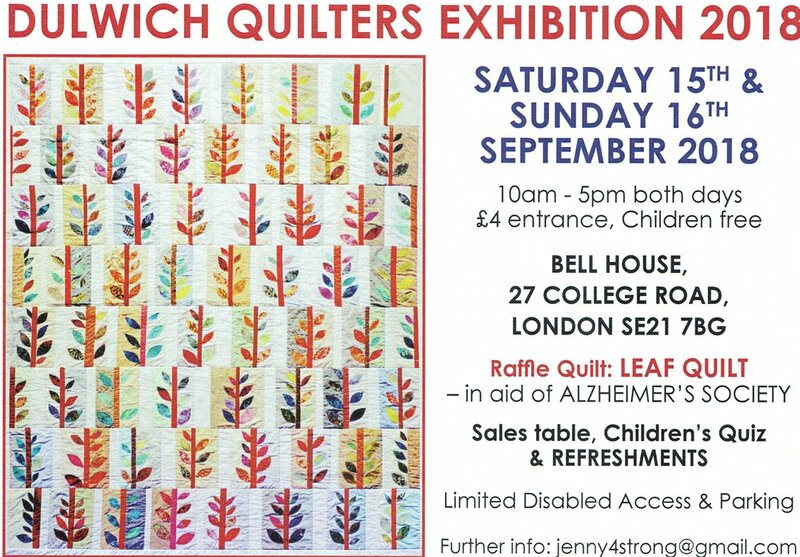 Bell House are very happy to be hosting the Dulwich Quilters Exhibition on the 15th and 16th of September. The exhibition will take place inside the beautiful Georgian House, and if weather permits the beautiful garden. There will be quilts, a shop and plenty of tea! As always the colours, styles, sizes and the techniques used to create the quilts is very varied. The Dulwich Quilters meet once or twice a month, at the South London Scout Hall, to sew, have workshops, exchange ideas and to chat! The work they are exhibiting is often the results of a workshop or individual ideas and techniques . There will be a selection of Linus quilts, which we make for children in King’s College Hospital, and we have been asked to provide quilts to cover the incubator in the premature baby unit, of which, sadly, many hundred are needed each year. There will be a chance to win the quilt pictured above. It will be raffled off in aid of the Alzheimer’s Society, and two other quilts will be sold for charities - The Paxton Green Time Bank and the SRA copy shop, a charity in West Norwood.